Sometimes, one has the good fortune of meeting that very special dog. Of all the dogs over a lifetime, he may not be the one who is with you the longest, is the best obedience or working dog, or even the one you loved the most. But he is by far the one who made the greatest impression, the one who taught you the most about dogs, compassion, and about yourself. You can’t completely put your finger on what he did or what it was about his personality, you just know it to be true. First a stray, then orphaned, then rescued again, Biscuit came to his forever home with us as a “hard to place” older dog with a heart condition. Yet in two short years he earned two obedience titles and was the quintessential party animal in Niagara, Toronto, and Florida, charming everyone he met. At seventeen pounds, he was an oversized but very handsome Pomeranian with sable colouring and markings. His story goes back to the time he was about a year old, discovered as a stray in a Buffalo suburb. Why a young purebred dog ended up on the streets remains a mystery. The coping mechanisms he learned weren’t his most stellar qualities, but with a loving home, they dissipated over time, and his gentleness became his most notable feature, thanks to Patrick. Patrick adopted Biscuit from the Second Chance Rescue. Mental health issues made it impossible for Patrick to live independently, hold a job, or drive a car. The world had been a difficult place for him, as it had been for Biscuit, and their relationship nurtured them both. For example, Biscuit learned to heel beautifully and naturally because they walked together for hours as Patrick confided in him. Patrick died of a stroke at the age of 35, leaving his family and his dog bereft. Patrick’s mother did the best she could to love and care for Biscuit, until her health problems forced her to move to an assisted living facility. After months in a boarding kennel, he was saved by Pomeranian and Small Breed Rescue in Ontario. Of course, as with many rescues, separation anxiety was a major issue. However, this probably endeared him to us more, as he was ever attentive. Even on the morning his heart finally gave out, rather than looking for a quite place to die alone, he stayed on the bed with his two humans until he took his last breath. Sometimes I wonder if Patrick was there to meet Biscuit when he arrived at the Rainbow Bridge. This is something we can never know for sure. But the answer has to be “yes” if we believe enough in the power of love. Daryl Novak lives in Niagara on the Lake with his partner Brian, and Rusty, a new healthy rescue Pomeranian. 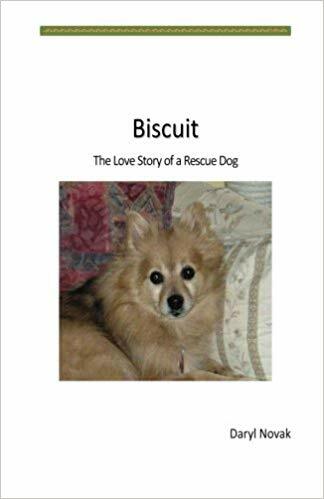 His commentary is based on his recent book Biscuit: The Love Story of a Rescue Dog. Copies of the book are available directly from the author at a cost of $10.50. Please click on the image to purchase the book on Amazon. All funds collected go toward recouping production costs and includes shipping within Canada.